No matter who you are, where you live or what you do, you have probably experienced a broken heart and a crushed spirit. It happens to each one of us at some point because we are unable to control what happens to us or what people may do that affects us. What we are able to control is our response. 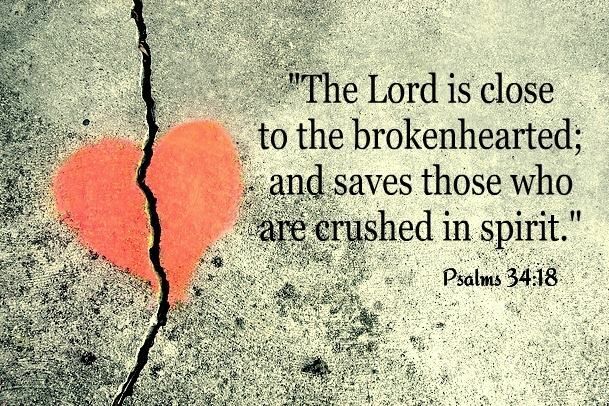 When our lives are centered in Christ we have some blessed assurance: the Lord will be close when our hearts are broken and he will save us when our hopes are crushed. When your heart is broken you have difficulty trusting anyone, the natural response is to isolate yourself from others. When your spirit is crushed you may even go so far as to give up. The good news is that when everyone else walks out, Jesus will walk in. He is a friend that stays closer than family. When you are finished, he begins. When you are weak, he brings strength. So keep your head up and your hope held high. People may let you down but Jesus is always there! He's as close as the mention of his name. You've got a friend!